Robair, percussionist, music journalist, improviser and published composer living in the San Francisco Bay Area, frequently tours North America and Europe as a soloist and often improvises in ad-hoc groups, such as this one you will hear tonight. Residing in Madrid, Spain since 1989, Matthews is an active composer, improviser and writer/lecturer. His dynamic work as an improviser has led to many collaborations with fixed groups, as well as sporadic performances throughout Europe. 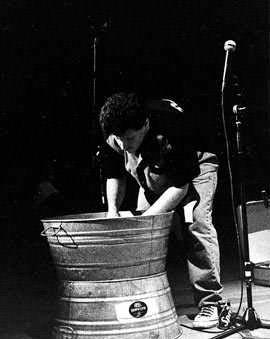 As an improviser, Rigler has also performed and participated (like Robair and Matthews) in experimental music and improvisation festivals throughout Europe. Rigler and Matthews have performed in duo as well as in trios and groups. Individually, each of these musicians has vast experience in collaborations with dancers, actors, interactive electronics, numerous recording projects as well as performing as soloists. They have also coincided in performing with many of the same musicians, but until tonight, have never collaborated together in this formation. Tonight is their first encounter. With an extensive background in both classical and contemporary music, the North American flutist Jane Rigler has considerable experience as an in- terpreter of contemporary music. After receiving her Bachelor's of Music in Flute Performance from Northwestern University in Evanston, Illinois, she went on to receive her Master of Arts and Ph.D. from the University of California, San Diego in Theoretical and Experimental Studies, focusing her work on the combination of the voice with the flute. Her repertoire covers some of the most complex and demanding works played today, including works such as Monolith by Vinko Globokar and Cassandra's Dream Song by Brian Ferneyhough.